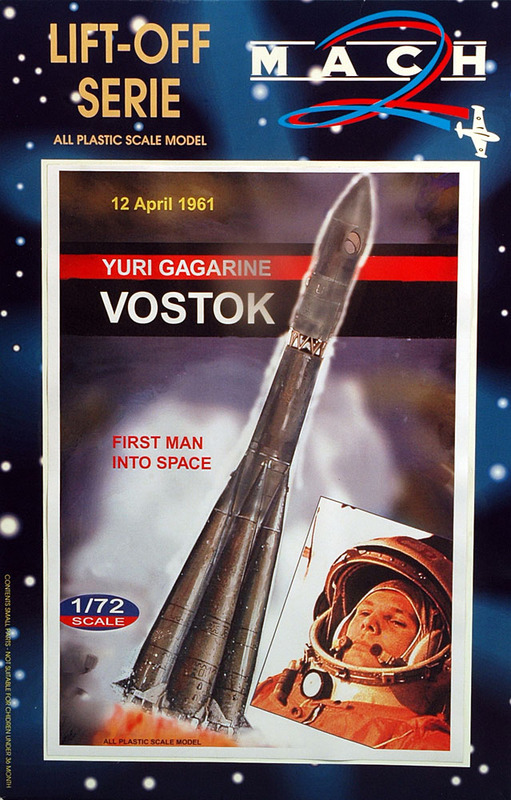 Although the 50th anniversary of the first manned spaceflight was on April 12, true space fans celebrate the achievement all year round. Well, that’s my excuse for looking at this kit in September! Cutting Edge 1:144 scale rocket at left, compared with the bigger Mach 2 version. The cosmonaut was borrowed from the Airfix kit. 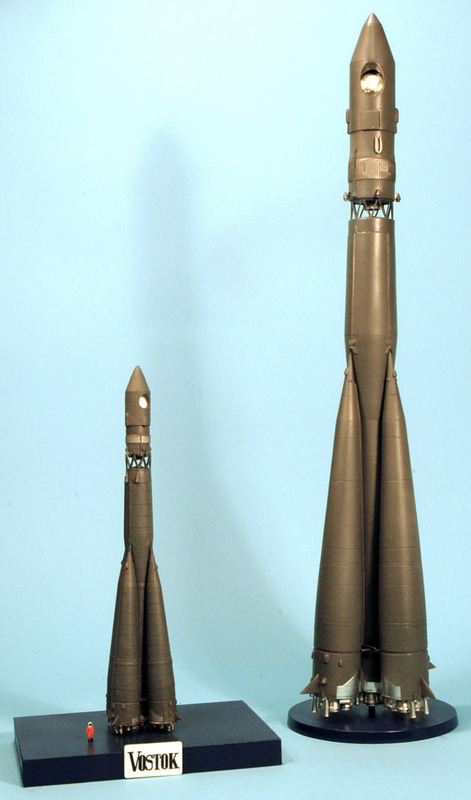 I have already covered the Airfix A-Type Vostok launcher, made to 1:144 scale, the generally accepted size for launch vehicles, and indeed, two of the other A-Type kits - the Apex/AER Moldova and the limited edition Cutting Edge resin release - have been in this scale. But how about a kit that’s twice that scale? This you can now get from the French limited edition kit company Mach 2, under the ‘Lift-Off Serie’ label. Having built this 1:72 kit, I have to say this is really one for the dedicated, as it is not an easy or straightforward build. 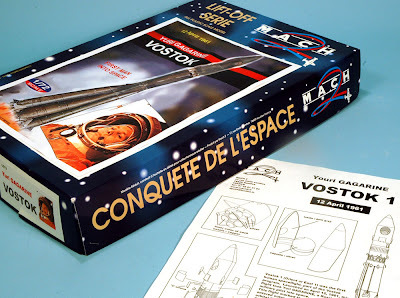 The kit is in styrene, so will assemble with conventional polystyrene cement, but is produced by limited-edition injection techniques which tend to mean that the mouldings are not up the standard expected from mainstream companies. More than 100 components make up the kit, though many are duplicate items, such as the 20 main and 16 vernier engines. 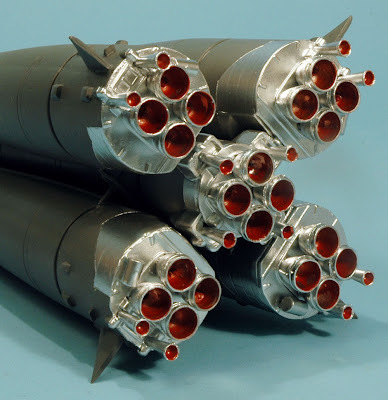 Most parts needed careful filing to remove mould lines, and when joining the boosters, filling with model putty along seamlines was required, which in turn meant that they needed smoothing and sanding. The instructions indicate the nature of the assemblies, albeit rather simplified, and it helps to have built the smaller Airfix kit previously. It takes effort to build this kit, and there are many areas where I had to accept that ‘it was what it was.’ However, when the subassemblies were finally looking reasonable, they were given a base coat of the very good Humbrol Grey acrylic primer, then topped off with Humbrol Matt Sea Grey 27, a shade chosen after the research I had done for the Airfix kit, which revealed that Vostok rockets are not green - as had been maintained for years - but a mid-grey. 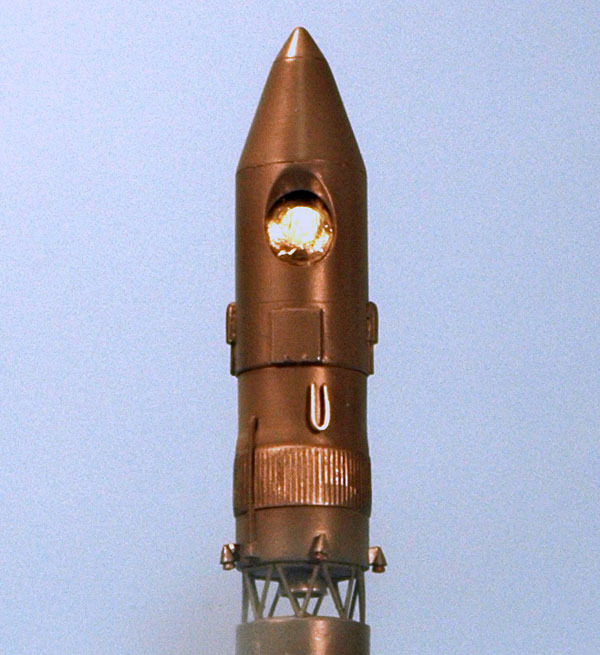 On this model, the only other colours are at the base of the boosters, which were painted bright silver, representing bare metal. For the best effect, these areas were masked and sprayed with Testors Chrome. Finally, the inside of the engine bells (32 in all) were painted with a 50:50 mix of Humbrol Gloss Ferrari Red 220 and Metallic Antique Bronze 171, which gives a highly realistic red-copper colour. I put a lot of time and effort into this kit, and the final result made it worth the sweat, as it doesn’t look too bad at all, and when compared to a 1:144 scale example (the Cutting Edge resin kit is shown here), it certainly proves that even through adversity, size can count.